Despite the loss, the Indian team is still one foot in the final to be played on June 10 with six points from two earlier wins. Head coach Stephen Constantine's strategy of making seven changes in his starting eleven did not yield the desired result as India suffered a 1-2 defeat at the hands of New Zealand in their final league match of the Intercontinental Cup football tournament on Thursday at the Mumbai football arena. Despite the loss, the Indian team is still one foot in the final to be played on June 10 with six points from two earlier wins. The home team had beaten Chinese Taipei (5-0) and Kenya (3-0). 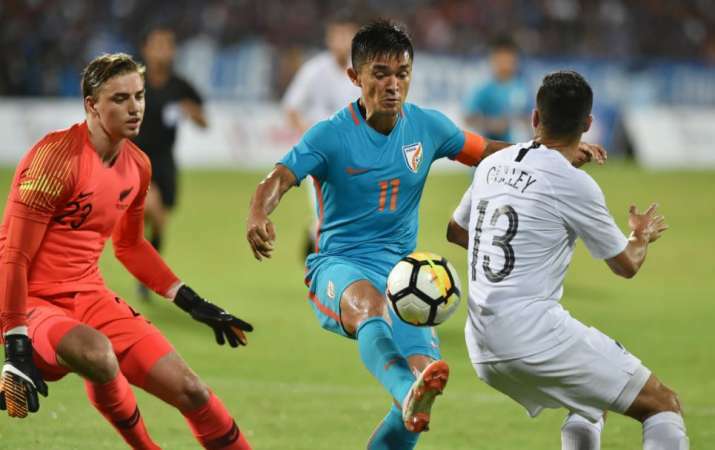 India took the lead through captain Sunil Chhetri in the 47th minute but New Zealand rallied through goals from Andre Earnest De Jong (49th) and Moses Dyer (86th) as the Indian defence looked shaky all through the match in front of a full-house Mumbai Football Arena. For Chhetri, who was playing in his 101st match, it was his 62nd international goal, levelling with the likes of Zlatan Ibrahimovic (62 from 116 matches) of Sweden and Ronaldo (62 from 98 matches) of Brazil. If Kenya beat Chinese Taipei tomorrow, it will be a complicated calculation to decide who play in the final. In that situation, all the three teams -- India, Kenya and Chinese Taipei -- will have six points each and head-to-head results will be considered and then the goal difference. Since, India has a goal difference of plus 7 as against plus 1 of New Zealand, it has a big chance to make it to the final. New Zealand had more chances in the first half as they kept the Indian defence under intense pressure after the half-hour mark. But they failed to find the Indian net and both teams went to the breather goal-less. Just after resumption, Chhetri scored in the most bizarre way giving his side a 1-0 lead. A back pass to New Zealand custodian Woud prompted him forward but his poor clearance hit Chhetri's foot and rolled back into the goal. But, India's joy was short-lived. Sarpreet Singh slipped the ball through to De Jong, who gave a fine finishing touch, sending the ball into the right corner of the net. After the comfortable wins in the first two matches, Constantine made as many as seven changes in his starting line-up though he made five substitutions later on. One of them was goalkeeper Gurpreet Singh Sandhu who made way for Amrinder Singh. He had also initially benched experienced Jeje Lalpekhua and Sandesh Jhinghan, who were back in the second half. New Zealand showed an aggressive intent and in the third minute Sarpreet Singh drooped it from a high but Amrinder parried it away to the left. Jai Ingham was nearby but Salam Ranjan Singh kicked the ball out. The second chance for the Kiwis came in the 13th minute when right back Justin Gulley crossed the ball in a tight angle to Andre De Jong, whose header went above the crossbar. For India, Chhetri did well to bring the ball down from a diagonal pass from Mohd Rafique but it was taken away by Kiwi custodian Micheal Woud. The India skipper appealed for a penalty but it was dismissed by the referee. In the 28th minute, Udanta Singh came in for Rafique. The best chance for New Zealand in the first half came in the 35th minute when Ingham floated a corner to the near post, which was headed by Myer Bevan, but Amrinder managed to keep it at bay. Minutes before the halftime came two good chances for India. Chhetri had made his way into the middle to give the ball to Ashique, but the winger took long to get his feet. Another chance was when Ashique sent in a cross which was headed back to Chhetri by Balwant Singh but the India skipper shot above the bar. At the halftime it was 0-0.